Appearance is something to which we as a culture give a tremendous amount of attention. We certainly aren’t the only species to obsess over it, but we are the first to build industries celebrating and feeding off of this widespread fascination. Women are traditionally used to espouse ideals of beauty, their bodies seen as objects to promote brands or lure in consumers. While images of women are generally more exploited for all sorts of businesses, leading to absurd standards in media and fashion – among others – men have recently been offered a taste of what that kind of unobtainable status can do to and for them. 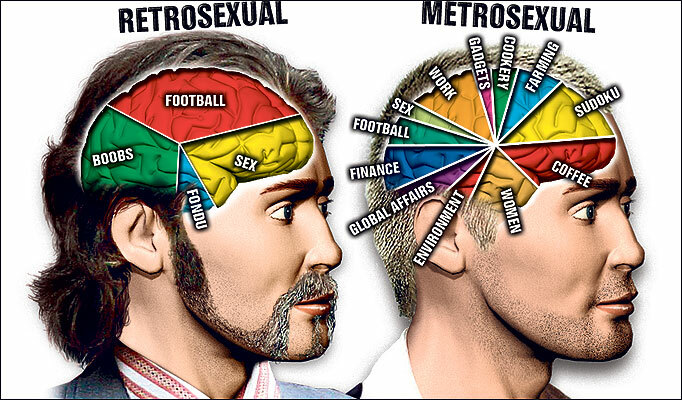 Enter the portmanteau ‘metrosexual’, a marriage of the words ‘metropolitan’ and ‘heterosexual’ that came onto the fashion and sociology scene in 1994. British journalist Mark Simpson coined the term in the newspaper The Independent, citing the new generation of effeminate and fashion-conscious men as the reason for its existence. In the nineties, colourful and bold fashion choices were being adopted by more and more straight men, despite the predilection for dressing conscientiously usually being associated with homosexual men and of course, women. Clothes weren’t the sole herald of this revolution either; men were buying moisturisers, exfoliating creams, hair gel, designer shoes and celebrity-endorsed cologne in droves, as immaculately styled as the photo spread of the GQ magazine that sold them on the idea. It was a new trend, typically among young people, and like many generational fads in the decades before, it rose and fell spectacularly. The new millennium offered a variety of other role models – most of them dressed in leather – but metrosexuals and their fantastic hair never truly left us. They and the companies that relied on their business merely branched out in their interests, incorporating sportswear and biker gear into what was otherwise known as a softer look. Thus the modern millennial metrosexual was born – or developed. Beauty products are known for having their promotional material and advertisements directed at women, but male beauty products exist too – albeit in a less overt way, and certainly never referred to as such. Male skincare products, hair products and deodorants are sold to men by appealing to their masculinity, which is ironic considering the social stigma of self-grooming among that demographic. A woman would buy shampoo labelled ‘lush apricot breeze’, where a man would buy an identically manufactured product called ‘FRUIT EXPLOSION’, probably in a huge, spiky font on a matte black bottle. The bad news is, men must maintain this ideal of aggressive masculinity even for something so basic; the good news is, everyone now smells like apricots. Media, of course, plays an enormous part in everyone’s self-perception. You can’t open social media or something ancient like a magazine without seeing the same female body splashed across the screen or page, eternally perfect and eternally impossible to achieve. For women that expectation of society is ubiquitous, and has been since men were given paintbrushes, and later photoshop. The pressure to look a certain way has simply always been there. For men, the process is different; having a universally accepted and attractive body is not as big a deal, excepting perhaps adolescent years. Men tend to be primarily judged on their skills, strength and character, no matter the age, while women and girls have their worth measured based upon how they look, what they’re wearing, and other shallow features. Almost more powerful than advertisements is media with more depth and variety; namely, film and television. The effect of films on audiences has changed slightly since the early days of Hollywood. Though both cinema and television mediums definitely had an impact on fashion, behaviour and activities, nowadays they seem to have more of an influence over people’s appearances – and that includes men. Action movies and their stars have always been popular, but it’s not until the past few years that superhero movies, and their super-fit actors, have been cast into the spotlight. Franchises that rely on fantasy and an extreme aversion of reality may not seem like the best foundation on which to build your ideal self, but people are doing it. Comic books – whose art distorts the human body to shapes that even the most brazen fashion brands wouldn’t expect of their models – provide the basis for these movies, and disseminate a false standard of body image to the most impressionable of consumers. They could be teenagers, or kids, or even grown men who haven’t bought into the ‘dadbod’ trend (a recent and enormously positive social media movement that received a criminally brief 15 minutes of fame, despite being quite impactful on men’s mental and bodily health.) Aside from the superheroes giving people mini-crises, sports stars of course reign as maintaining the most influence over men and boys; they without a doubt are the only category of role models that could outrank Thor or Captain America. Athletes obviously have a certain body type, which again, not everyone can imitate, and that can be distressing to young men who have an idea of how they should look based on Cristiano Ronaldo’s abs. The term ‘metrosexual’ will soon become redundant as fashion evolves, but the habits of the consumers that began and later brought back that trend will remain for a long time – regardless of gender or sexuality.